File a lien against any future claim for compensation you may have – So, if you’re injuries were caused by another party’s negligence and you pursue a claim against that negligent party, the hospital lien can attach to your claim when you file it. Be paid out of any compensation you receive from a future claim – And that payout comes before you receive any money. Texas’s Hospital Lien Statute (Property Code 55) is the law that grants hospitals these rights. It also lays out some strict requirements that must be met for the hospital lien to be valid. If hospitals fail to comply with these requirements, the lien will not be valid. All too often, hospitals looking to make an extra buck will abuse the Hospital Lien Statute, filing invalid liens. To help you figure out if a hospital lien may be invalid, here’s a look at the top five ways hospitals abuse the Texas Hospital Lien Statute. For more answers and helpful legal advice, simply contact the Amaro Law Firm. Have You or a Loved One Been Hurt by Another’s Negligence? Are You Dealing with Hospital Liens? 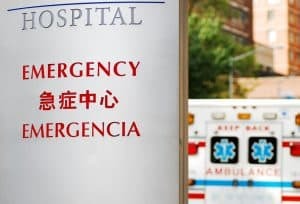 A patient has only been treated in the emergency room – By law, hospital liens can only be valid for care that’s associated with inpatient treatments. That means that you must have been admitted to the hospital by a doctor, not just treated in an emergency room. If you were never admitted to the hospital (or if you were admitted weeks later), the lien probably won’t be valid. Care has been provided 72 hours or more after the accident or injury-causing event – Liens will only be valid if they’re related to inpatient care provided within 72 hours of the incident that caused the injuries. Unnecessary treatments have been administered – When hospitals know that injuries were caused by an accident (like a car crash or truck wreck), they may expect a future personal injury case and, consequently, provide unnecessary treatment to increase their bill. The Hospital Lien Statute prohibits these practices, requiring liens to only be associated with medically necessary care. Care is associated with excessive charges or unreasonable rates – This form of hospital lien abuse goes hand in hand with the above one. It’s another way hospitals may try to inflate bills associated with liens, and it’s illegal under the Texas Hospital Lien Statute. Compensation has already been paid to the patient – By law, hospital liens will only be valid when they’re filed before a patient received compensation (and when they’ve been filed in the county where treatment has been provided). A Houston personal injury lawyer at the Amaro Law Firm is ready to partner with you in the pursuit of recovery and justice. Whether you need answers about a potential personal injury case or it’s time to fight an invalid hospital lien, we’re here for you, ready to help. At the Amaro Law Firm, our experienced attorneys are known for superior representation, personal service, and outstanding results. We know how to stand up to any opponent, protecting our clients’ rights while working relentlessly to maximize their financial recoveries. While we know that money cannot erase the impacts of serious accidents and injuries, compensation from personal injury claims can help people heal and restore their lives. That’s why we’re committed to helping our clients fight invalid hospital liens so they can retain as much of their financial recovery as possible. The Amaro Law Firm’s record of excellence and success in all types of personal injury cases has earned us a 5-star rating on Google and Facebook, glowing testimonials from former clients, and a 10 rating on Avvo.